Pioneering the global development of an uncorrelated, alternative asset class. The Bet on Combat Group are fund managers whose investment universe centers on combat sports and events. Bet on Combat Investment Fund or short form BOC Fund® is a registered entity that operates like a traditional mutual fund, pooling investor’s funds into a common hedge fund and investing them in the combat sports betting marketplace. The Bet on Combat Group was created with a view to offer investors an alternative product to shares, bonds, property and other “traditional” investment vehicles and asset classes. We are fund managers whose investment universe focuses on the burgeoning markets of combat sports and event investment. In this nascent sector we provide unparalleled investment intelligence, funds management expertise and through the use of technology, customer service. Bet on Combat’s investment universe is independent of prevailing economic conditions, is ostensibly recession proof, and offers returns that are uncorrelated to any other mainstream investment product. Subsequently, in formulating a balanced and diversified investment portfolio we believe it is prudent to have exposure to this sector. The Group comprises two Funds management companies operating and executing identical investment strategies. Founded in 2010, Bet on Combat Group is the Investment Director for the Bet on Combat Investment Fund or short form BOC Fund®, a small scale private fund that has consistently out performed the global benchmark indices, and manages approximately $2.8 million in assets as of February 1, 2018. The Bet on Combat Group was formed in 2010 with a vision to pioneer the development of an uncorrelated, alternative asset class. Founded by a group of senior business and gaming executives, they had identified the opportunity to secure superior returns through the application of mainstream portfolio and investment management techniques to the nascent industry of sports and event investment. Through extensive research, due diligence, fundamental analysis and the use of technology, The Group has been able to develop a rigorous system grounded in statistical data, much the same way as has been achieved in more traditional financial markets, to produce superior returns. The BOC Fund® is domiciled in St-John’s, Antigua and Barbuda and is open to retail and wholesale investors with USD$1,000 or more. The organogram of the Bet on Combat group companies can be found at the end of this document in Attachment A. In this nascent sector we provide unparalleled investment intelligence, funds management expertise and through the use of technology, customer service. The objective of Bet on Combat’s Funds is to mitigate much of the risk inherent with combat sports and event investment and generate long-term returns in excess of the major stock market and the global hedge fund indices. The benchmarks by which to gauge investment performance are the Dow Jones index, S&P 500 indices and the Global HFRX Index. BOC Fund® uses an approach that is grounded in historical statistical data to analyze investment opportunities across a number of combat sports and international events that are offered on global betting exchanges and by registered bookmakers. In general, BOC Fund® trades long and short combat sports and event strategies that have a directional component and relative value strategy on either sports betting exchanges or with registered bookmakers. BOC Fund® utilizes short and medium term time frames and includes opportunistic intra-event trading as part of its overall strategy. 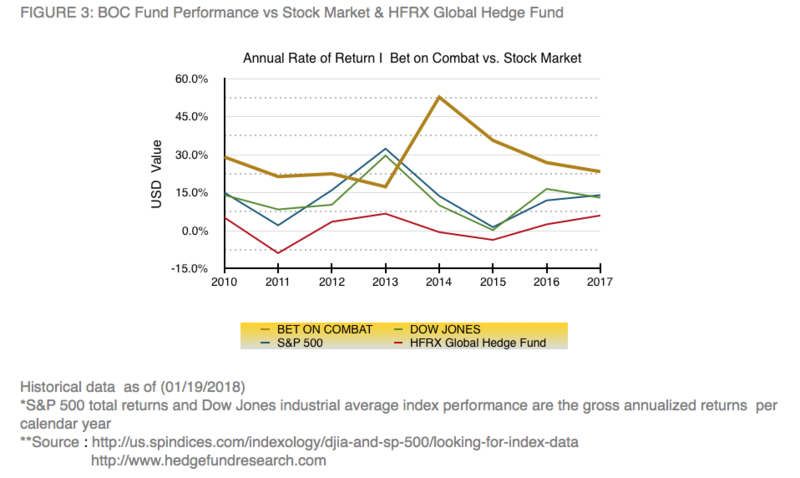 Non-correlated Returns: Bet on Combat’s fund returns are not correlated to the performance of traditional investment products such as stocks, bonds, property etc. Subsequently, Bet on Combat’s funds can provide your investment portfolio with valuable diversification. Investment Returns: Bet on Combat’s fund returns have historically been commensurate with other mainstream investment products. Subsequently, as part of an overall portfolio, an investment in one of Bet on Combat’s funds can be highly attractive. Recession Proof: The asset classes invested in by Bet on Combat’s funds are ostensibly impervious to domestic or global economic conditions and hence un-correlated returns can be achieved more consistently. Reduced Volatility: Bet on Combat does NOT use leverage. Subsequently, the volatility associated with most alternative asset classes does not pervade Bet on Combat’s Funds. We are able to generate significant returns without the downside risk that our competitive funds incur. This is why BOC Fund® is trusted to manage more money than any other sports investment firm in the world. * Statement above based on AUM as of 12/31/17. The Bet on Combat Group’s Management and Investment team are comprised of former financial advisors, oddsmakers, experienced sports, gaming and business executives who study and analyze every fighter and every fight event to develop better information, make smarter predictions and win more money. They know what's going on inside the training camp. They know who wants it more, who's injured and who's out for revenge. They analyze upcoming match ups to find out how two fighters really compare and then provide the in-depth analysis for every combat sports wager. These wagers are further scrutinized by a proprietary big data analytics program for validation. As Professional combat sports analysts, they look at combat sports betting just like buying stocks, futures, options, or investing in general. The founder and Chief Investment Officer (CIO) of Bet on Combat Group LLC is M. Franco Richard, also known as Francombat, a dedicated income investor and successful entrepreneur. If you haven’t heard about him before, he is the guy from Montreal, Quebec who dropped out of college and started to bet his own money on the outcomes of fights and became a multi-millionaire by the age of 27. With unconventional business approaches, M. Richard has firmly established himself in the online gambling industry as the go-to experts on how to make money betting on fights. As of today, he has the longest running and most profitable combat sports betting record in the industry. Franco has proven that it's possible to become filthy rich outside Wall Street, and wagers over $100,000 a week on fights. The CIO has a background in martial arts and worked as a oddsmaker and consultant for some of the world’s top sports books from Las Vegas to Antigua to Macau. Additionally, the CIO has worked in investment banking, private equity and venture capital across a range of industries. In response to the erratic nature of mainstream financial markets, coupled with the proliferation of betting exchanges such as Betfair (www.betfair.com) he identified the potential of profitably trading on the combat sports and event markets, leading to the establishment of Bet on Combat Group LLC in 2010. A two-time World Kuoshu gold medalist M. Richard has participated in many Lei Tai tournaments all over the world, compiling an overall amateur record of 11–3. In each one, he has always ranked as one of the best in the Light Heavyweight division, thanks to his determination, incredible skills, and combative spirit. This background as a competitor give him a deeper understanding of the mental aspects of the fight game. Practicing martial arts and fighting experiences allows him to obtain the most intricate details in every facet of the combat sports. A team of analysts with experience in sports and investment and professional qualifications in quantitative disciplines such as science, accounting and mathematics support the CIO through undertaking extensive statistical and trending analysis coupled with rigorous background research and market intelligence. Additionally, through the use of data scientists and IT specialists the Group have developed sport-specific algorithms that are used to identify value in all markets. The results of this research underpin all investment recommendations and decisions undertaken by Bet on Combat Group LLC. The BOC Fund® is a pooled investment fund where investors buy shares (nominal value of USD$1000.00) in a private limited company registered in Gibraltar/Las Vegas that is managed by Bet on Combat Group LLC also based in Gibraltar/Las Vegas. The primary advantage of the fund being pooled is that it means each investor secures the same price for every trade, pro-rata depending on proportion of total FUM. Funds with segregated accounts permit the manager to “front run” and hence profit, risk free at the expense of their clients. This practice is impossible given the structure of the BOC Fund®. The financial year end of the Fund is 31st December of each fiscal year. The BOC Fund® is underpinned by extensive statistical and probability analysis to identify intrinsic value in the individual markets. Much the same as in more traditional financial markets, investments are only made when there is a clear differential in the intrinsic value in any individual selection and that offered by the market(s). Once the intrinsic value has been identified the decision is made to either “back” the investment (“long position” in financial market parlance) or “lay” it (“short position”). As soon as a trade is “in-the-money” Bet on Combat Group LLC will look to either fully or partially trade out of its position, thereby securing an immediate profit and reducing its overall exposure. In the event that a market moves against our position a series of stop-loss orders will be executed in order to protect capital and mitigate losses. The Fund is administered in much the same way as those in traditional financial markets. Extensive portfolio and risk management principles are strictly adhered to with the results independently audited. Interim monthly and quarterly returns are communicated to investors via the website Investor’s Area. Additionally, investors can view their portfolio position at any time via the secured Investor’s Area as well as by text message prior to fight time. Our investment portfolio is spread out through a number of sports, events and competitions around the word. Our investment universe includes but is not limited to investing on international sports and events. Offering of the funds coincide with major combat sports leagues to include boxing (WBC, WBA, WBO, IBF), Kick-boxing, Muay Thai (Glory, K-1) and Mixed Martial Arts (UFC, Bellator, ONE Championship, Professional Fighter League, Invicta, Titan) and other sports, events and competitions. Because we are a combat sports and event investment fund, focused primarily on the combat sports betting market, the main Sports where the Fund is invested in are MMA, which represents 29% of the investment volume, Boxing 22% followed by Kick-Boxing with 14% and Muay Thai with 12%. American Football represents 6% of the invested volume, while Ice Hockey has an 8% slice. Volleyball with 4% and eSports with 3% still represent meaningful parts of our investment portfolio. Sports here can be thought as Sectors, and our portfolio is well diversified across a number of them. The BOC Fund® is a medium risk value fund suitable to investors who want to diversify their portfolio to include a product that is impervious to the financial markets and the general economy, and who seek returns that are uncorrelated to any other existing investment product. The BOC Fund® takes an even approach to investing by holding a diverse range of combat sports and event positions, providing good growth potential with a medium risk of short-term volatility. An investment horizon of 3-5 years is recommended. Bet on Combat Group works with individuals who are serious about investment and creating an effective and prosperous sports wagering portfolios, either as their primary form of investment or as a way of diversifying their current portfolios. It is available to retail and wholesale clients who wish to invest USD$1,000 and above. There is an investment lockup period of 12 months after the date of purchase. A 30% management/performance fee is applied to the profits. High water mark is used. A unit share in the BOC Fund costs $1000USD. The gross return of the Bet on Combat Investment Fund since inception (1st January 2010) through to December 31st 2017 has been approximately +196.23%. During the same period the benchmark Dow Jones returned +102.09% while the S&P returned +106.65% and the HFRX returned +10.82%. This is why BOC Fund® is trusted to manage more money than any other sports investment firm in the world. In accordance with the Fund’s Memorandum and Articles of Association each investor’s portfolio will be calculated by Bet on Combat Group, LLC at the close of business in Antigua on each Valuation Day. The Fund will issue monthly, quarterly and six monthly reports with regards to Fund performance, based on the unaudited performance of the Fund. Annual financial statements will be provided, upon request, six months after the Fund’s financial year-end. **Returns are based on simulated results and are gross of tax and fee. 2017 performance is currently being finalized. Investment returns are not insured by the FDIC and carry risk of loss. Past returns cannot guarantee future results. Contact us to learn more. The Fund uses an approach that is grounded in historical statistical data to analyze investment opportunities across a number of global sports and events that are offered on global betting exchanges, registered bookmakers and regulated pari-mutuel licensees. In general, the Fund will trade long and short sports and event strategies that will have a directional component and relative value strategy. The Fund will utilize short and medium term time frames and will also include opportunistic intra-event trading as part of its overall strategy. Bet on Combat Group’s BOC Fund takes an even approach to investing by holding a diverse range of sport and event positions, providing good growth potential with a medium risk of short-term volatility. The maximum exposure/liability for any opening pre-event trade is imposed at 3% of Assets Under Management (AUM). Such a trade will only be executed when there is greater than 25% perceived value in the market. Typical exposure/liability for pre-event trades is 1.25% AUM. In-play investment is restricted to a maximum exposure/liability of 1% of AUM owing to the reduced time to expiry of the trade. In both trade types the Fund will enter positions with the intention of maintaining them for the short to medium term unless market influences, new information or analysis make it prudent to exit the positions to realize profits or to stop or mitigate losses. The Fund does not borrow, nor will it use leverage. The BOC Fund’s risk factors are considerably more limited than the risks surrounding your usual Fund or any stock market investment. 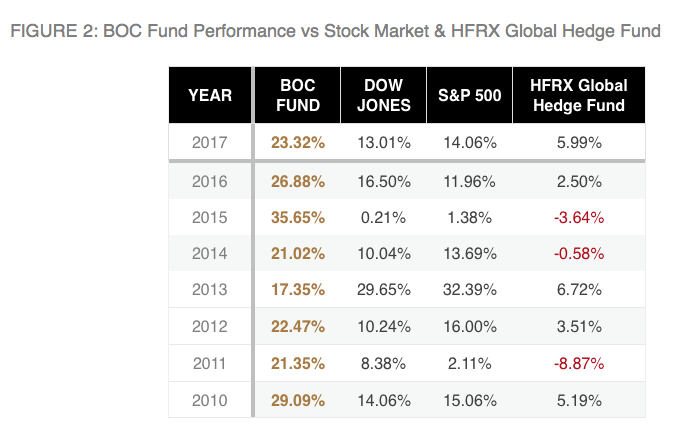 First as mentioned before, the performance of the BOC Fund is totally uncorrelated from any market factor, economic data or event. The correlation to financial benchmarks is 0. There’s no risk of being stuck in a position due to limitations in liquidity, the BOC Fund only does pre-fight fixed odds bets (1% or so might be live bets). Capital is readily re-available for investment meaning that the BOC Fund is highly liquid being able to have 70% of its Funds Under Management in the Bank Account. While only 30% are needed in betting accounts to correspond to our daily investment requirements. BOC Fund only works with top tier business partners, leaders in their fields and 200% warrantied. We trust our funds only to the most reputed bookmakers and bet brokers. The funds will be deposited always in international banks. Risks to the development of the Fund’s investment activity are mainly at a legislative level. If somehow a wave of banning and limiting wagering on sports betting comes to shore, that could put into questioning whether the Fund’s existence still makes sense. Yet, the current trend is for the legalization of sports betting, and it is possible that in the next decade we see the legalization across all USA. That would increase liquidity in individual event markets exponentially, creating a market for an industry of sports betting investment funds to appear. There is the hypothesis that the markets in the future will become so efficient there is no longer room to feasibly generate positive returns in the long term from sports betting. Theoretically the more money and participants come in the sharper market prices become, this would dilute the advantage possibly to 0 if the markets become that big. As mentioned our investment portfolio is spread out through a number of sports and competitions. 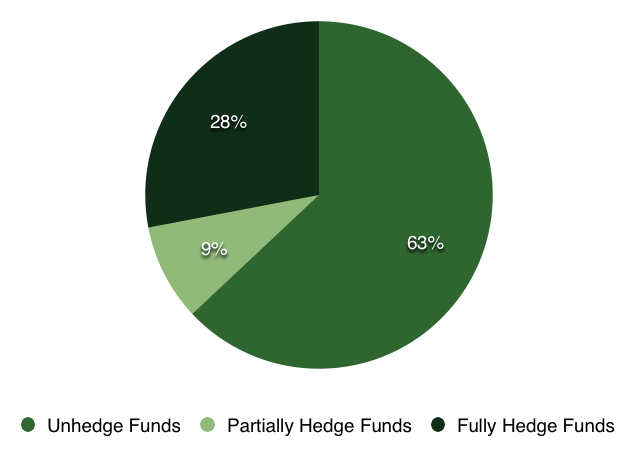 The main Sports where the Fund is invested in are Tennis, which represents 29% of the investment volume, Basket 22% followed by Football with 14% and Baseball with 12%. Bet on Combat Investment Fund (“BOC Fund”) is not a mutual fund, has never claimed to be a mutual fund, and should not be referred to as such. Any official references to BOC Fund® as a mutual fund are not knowingly or purposefully of BOC Fund’s doing. BOC Fund is not registered with the SEC and has no association with FINRA. BOC Fund® is a legally registered entity wagering firm domiciled in St-John’s, Antigua and Las Vegas, Nevada, USA. Business licenses and certificates of good standing are available upon request. Returns shown in presentation and on website are based on simulated results and are gross of tax and fee. Investment in BOC Fund® carries risk of loss, and returns are not insured by the FDIC. Past performance cannot guarantee future results. Language in this presentation and on BOC Fund’s website, www.betoncombat.com, is for advertising purposes and should not be considered as investment advice. BOC Fund® cannot be held liable for any investment decisions or actions made by parties privy to this presentation, BOC Fund’s website, or other entity wagering materials. The information contained in this document is published by the Bet on Combat Group. The information contained herein is not intended to be advice and does not take into account your personal circumstances, financial situation and objectives. The information provided herein may not be appropriate to your particular financial circumstances and we encourage you to obtain advice from your own independent sources before making an investment decision. This information pays no regard to the specific or future investment objectives, financial or tax situation or particular needs of any specific recipient. No representation or warranty as to the accuracy of the information contained in this document is made or implied. The details and opinions in this document are provided by the Bet on Combat Group without any guarantee or warranty and are for the recipient’s personal use and for information purposes only. This document is no offer or solicitation to purchase shares in the BOC Fund. All BOC fund performance numbers, unless otherwise stated are gross figures. Past performance is not indicative of future results. If the currency of the fund is different from your reference currency, the return can increase or decrease as a result of currency fluctuations. No reader should rely on this document as it does not purport to be comprehensive or to render personal advice. Bet on Combat Group reserve the right to deny any applicant without explanation. For further information about the BOC Fund, you can obtain a copy of these documents on our website at BetonCombat.com/Investing. Join over 1,000 investors in the world’s best performing betting platform and start earning your 2nd income. Please create a free account before submitting an application form.